This day-by-day diary of The Rhythm Dukes' live, studio, and private activities is the result of two decades of research and interview work by Bruno Ceriotti, but without the significant contributions by other kindred spirits this diary would not have been possible. So, I would like to thank all the people who, in one form or another, contributed to this timeline: John Barrett, 'Fuzzy John' Oxendine, Jerry Miller, Bill Champlin, Dale Ockerman, Bill Leidenthal, Ross Hannan, Corry Arnold, Michael Parrish, Colin Hill, Charlie Kelly, Erik Krogh, David Kueker, Rob Hamilton, Jeffery Dunn, Light Into Ashes, Berkeley Barb, Berkeley Tribe, The Arizona Republic, San Francisco Good Times, The Petaluma Argus-Courier, San Francisco Chronicle, and Santa Cruz Sentinel. 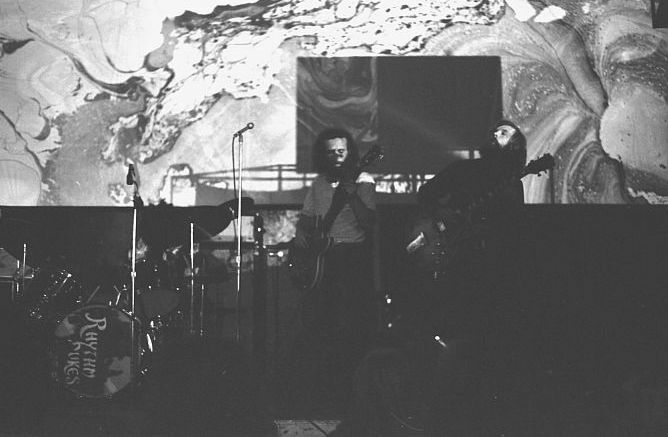 Widely regarded as the first Bay Area supergroup, The Rhythm Dukes were put together by Jerry A. Miller (b. Saturday, July 10, 1943, Tacoma, Washington), lead guitar player of the recently disbanded Moby Grape, and John Harold Oxendine, aka 'Fuzzy John' (b. Friday, July 19, 1946, San Francisco, California), drummer of the recently disbanded Boogie, after the pair met by chance one day up in the Santa Cruz Mountains. 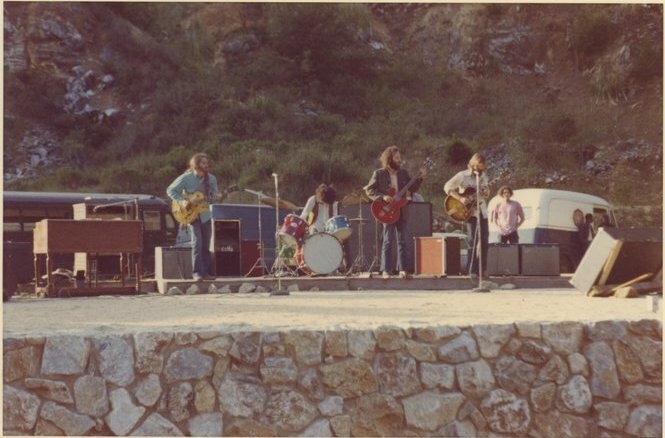 "After Boogie disbanded, I joined the Sons Of Champlin as 2nd drummer," Fuzzy John recalls, "then one day [right after my first son Thomra was born on July 5] I went to Santa Cruz to see some property I had in the mountains, driving up a dirt road in the middle of nowhere and as I was driving I look of to the left and there was Jerry sitting out front of his house, about 300 feet from my property." 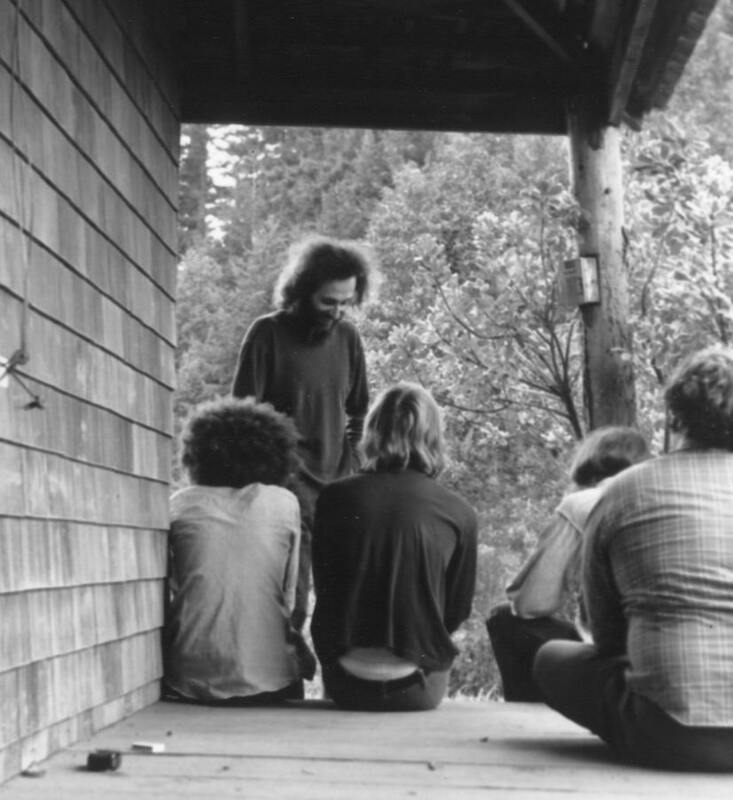 "After Moby Grape disbanded, I went back to Boulder Creek (near Santa Cruz), where I had a home up in the mountains," Jerry confirms. "Jerry and I had met when I was in Boogie and jammed and became immediate friends," Fuzzy John adds. "Moby Grape was in turmoil and Jerry said: 'Let's play'. So I went back to Marin County and left the Sons [after only one month]. I said: 'I'm going to Santa Cruz'. I knew Bill Bowen [the Sons' "main" drummer] was unhappy with the situation. I felt I was causing turmoil. I was not the same. When I saw Jerry it was meant to be." To complete their band, Jerry and Fuzzy now needed a bass player and a rhythm guitar player. At Jerry Miller's suggestion, another former Moby Grape, Donald J. 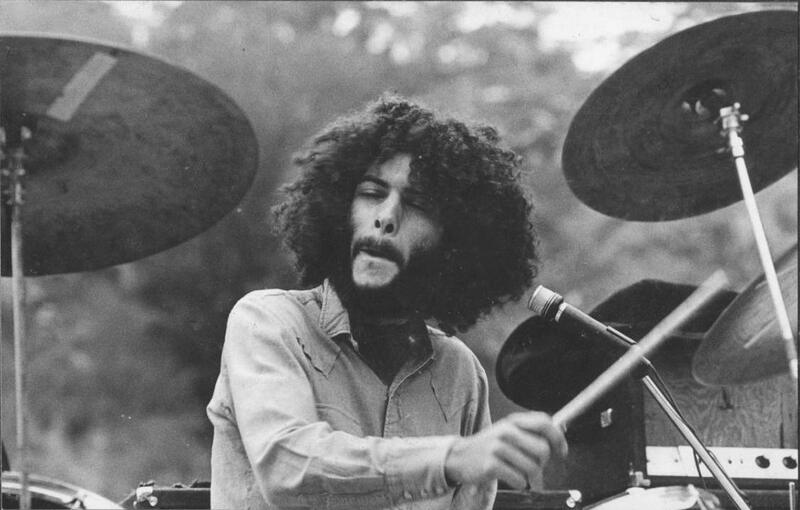 'Don' Stevenson (b. Thursday, October 15, 1942, Seattle, Washington), was added to the newly born band on rhythm guitar, although he was actually a drummer! "We were going to pick up Don Stevenson [in the band], so that there would be at least a couple of us from Moby Grape," Jerry Miller confirms. Now they only needed to found a bass player. "Moby Grape [sic] are back together minus one bass player," The Arizona Republic daily newspaper confirms on July 19. "As soon as a fourth member is found they will once again be hitting the circuit." For the bass player spot, Fuzzy John suggested his former Boogie's bandmate John Howard Barrett, aka 'JB' (b. Thursday, May 30, 1940, Winsted, Litchfield County, Connecticut). 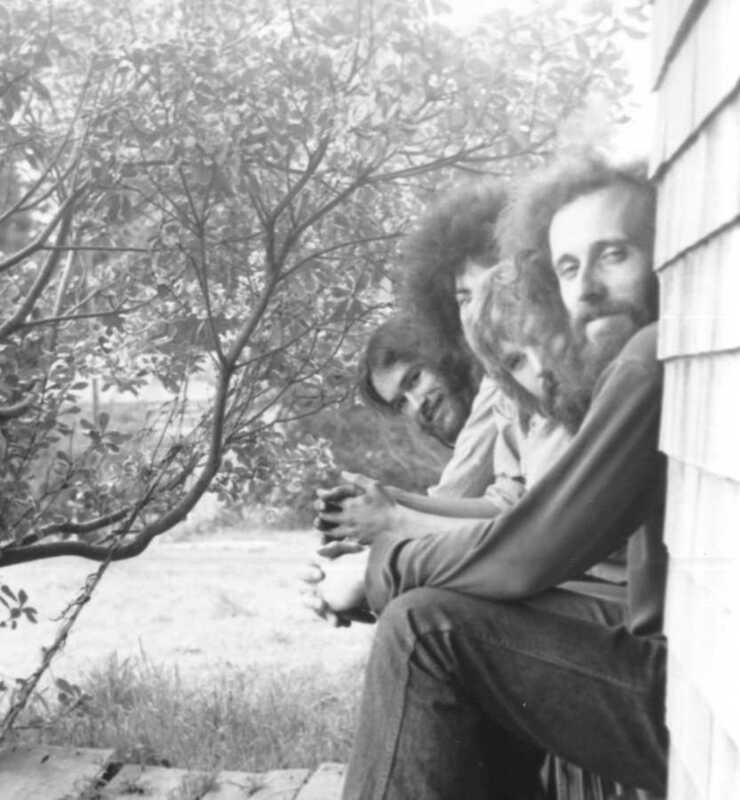 "A little while later [after Boogie disbanded], Jerry Miller called me and asked if I would like to form a band with him, Fuzzy and Don," John Barrett confirms. 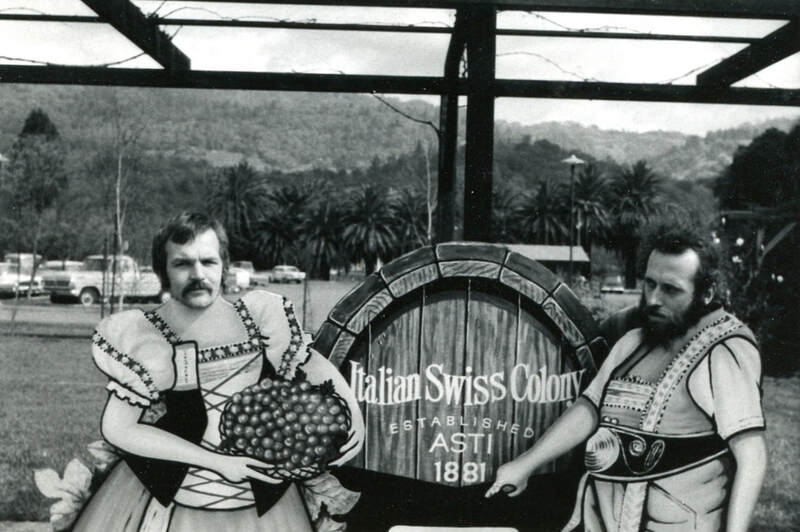 "Of course I said yes, and moved to Santa Cruz where the Rhythm Dukes were formed." 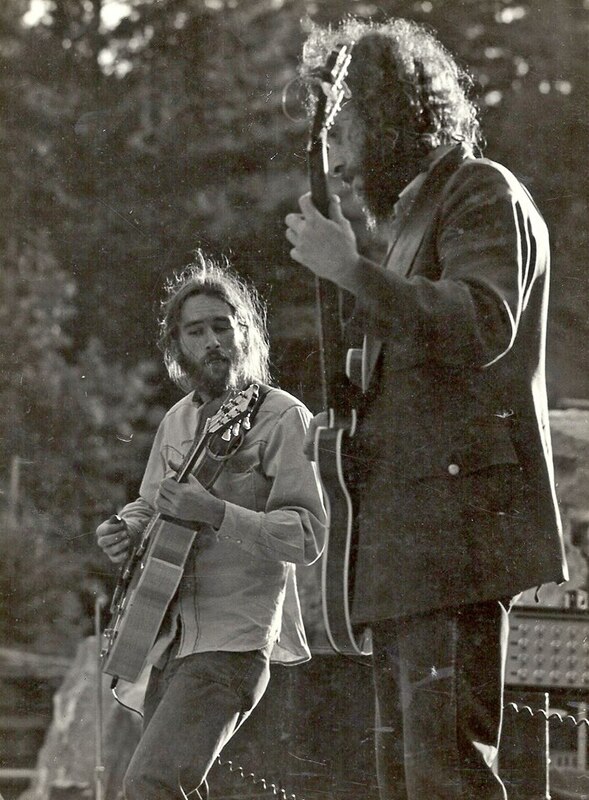 By the way, Jerry and John knew each other since 1966 when the latter sat-in with Jerry's band The Frantics one night at the Drag' on A' Go-Go in Chinatown. So, the newly born four-piece band was christened The Rhythm Dukes, although, due to the presence of two former members of Moby Grape, many promoters billed the group as Moby Grape anyway, much to the band's frustation, since not only were they a different group but the billing would not have helped their legal situation with Moby Grape's former manager Matthew Katz who had the ownership of their name at the time. Soon after the Dukes started rehearsing together at The Farm, an old 1850's stagecoach stop and tavern located at 1906 Glen Canyon Road, on the road from San Jose to Santa Cruz, near Scotts Valley. "The Farm was a parcel for sale by M.C. Hall, real estate who rented the farm to us Dukes," John Barrett recalls. A great place for a band, away from the road on "80 acres of land, formerly a berry farm," John adds. "Rows of blackberries, apple orchards and cherrie trees." The house was funky, but they fixed it up real nice, built a rehearsal room and started writing and playing music. John and Fuzzy also lived at the farm with their wives (Britha Dahle and Lynn Quayle respectively) and children (John's daughter Kristina and Fuzzy's son Thomra), while Jerry (with his wife Cheryl and their two kids) and Don had homes in Boulder Creek. "Today it is mega-bucks upscale homes for rich Silicon Valley tycoons," John also recalls about the farm. The Rhythm Dukes, billed as Moby Grape, were advertised to play at the annual Canadian National Exhibition, Canada's largest annual fair and the fifth largest in North America. 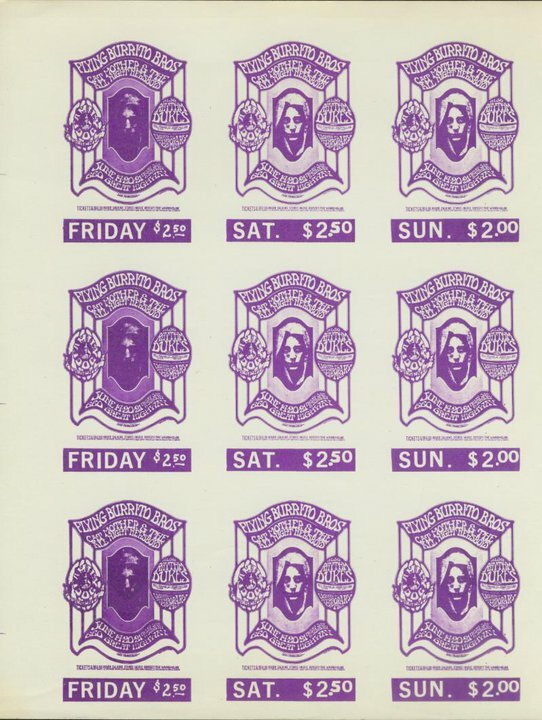 However, the band never played in Canada as John Barrett recalls, so the gig was ultimately cancelled or at least the Moby Grape on the bill were just a fake one put together "ad hoc" by their former manager Matthew Katz. 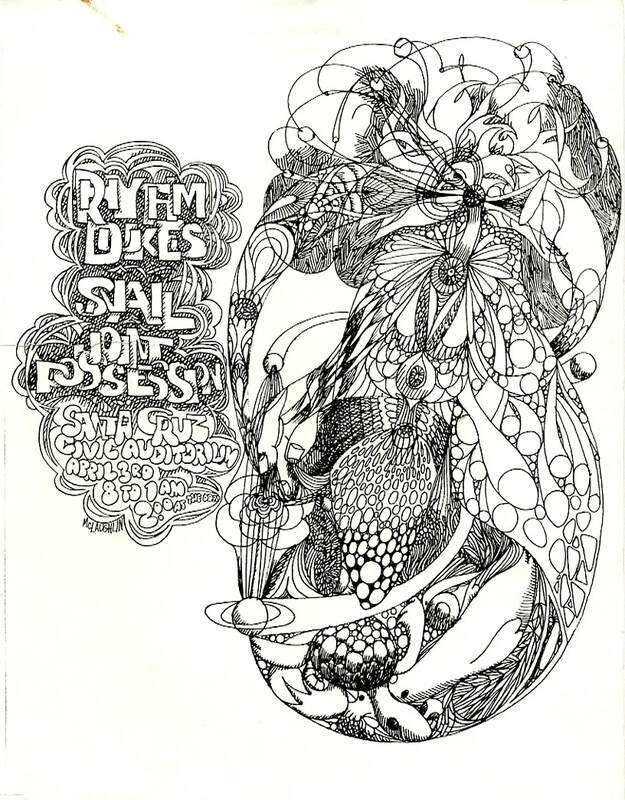 The Rhythm Dukes, billed as Moby Grape on the poster printed for this show, play in what should have been their debut gig tonight. Also on the bill: Fields, Bycycle. Lights by Deadly Nightshade. After just over a month of rehearsals and supposedly only one gig, Don Stevenson left the band. "Don was there and we rehearsed for a while but he dropped out," John Barrett confirms. "He probably prefered to play drums instead of guitar." 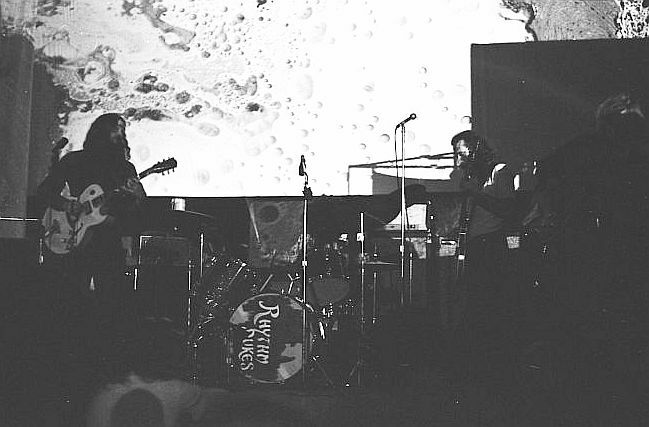 "We have a tour that Moby Grape had already booked in the Midwest," Jerry Miller recalls, "but when it was time to leave for the airport, Don decided he didn't want to go, so the Rhythm Dukes went ahead as a trio. We would come out and say, 'Moby Grape can't be here, but I'm Jerry Miller,' and we sure as hell didn't disappoint. In fact it was one of the most enjoyable things I've done. It was one of my first chances to rip things up as a power trio! It was good fun." So, at that point, as Jerry recalled above, the band flies to Illinois for the first dates of the tour as a three-piece. 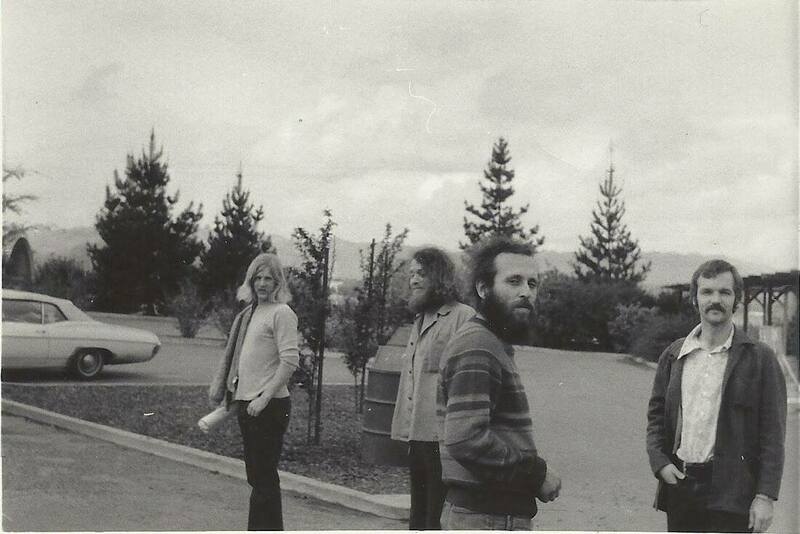 "I do remember one of the Moby Grape roadies (big guy with brown hair, mustache) giving me $100 at SFO [San Francisco International Airport] and telling me to 'give this to the Sky Cap to make sure the amps and gear get on the plane," the band's equipment manager (and former Boogie roadie) William Warren 'Bill' Leidenthal recalls. "Nothing like a bribe to make things happen back then. No effin way these days." 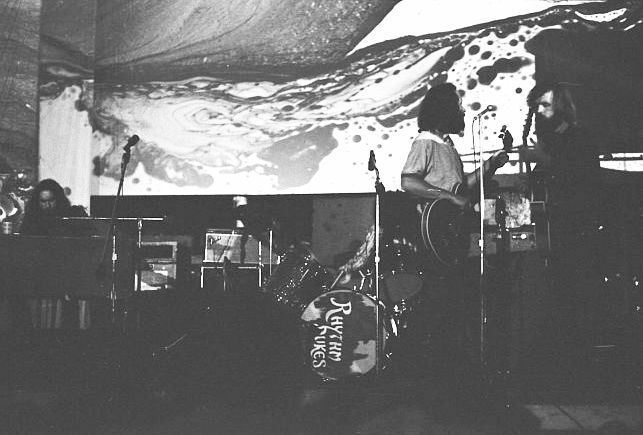 The "Moby Grape Midwest Tour" began in Frankfort, Illinois, with four nights at the local Valley View Young Adults Club. 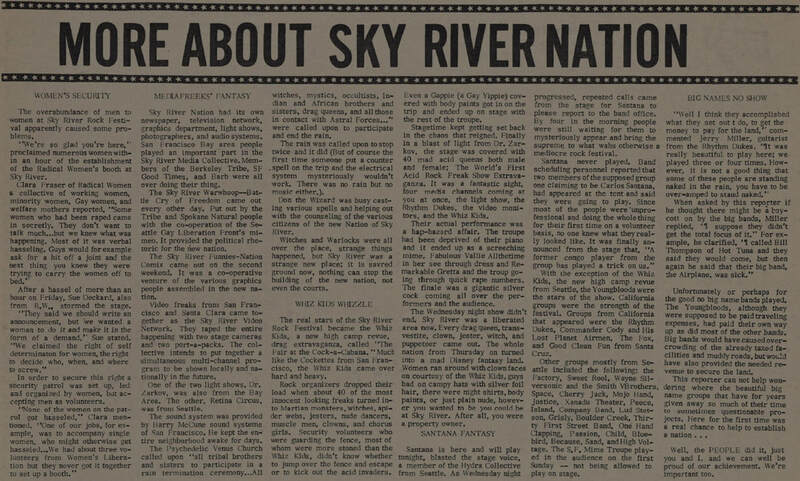 "One night Moby Grape played in this club in Frankfort and I was there," a unidentified member of a Chicago area band called The Red, White & Blues Band recalls. "I got to meet Jerry Miller, Peter Lewis and Bob Mosley. Jerry and Peter were very cool. Mosley was on the nod." Well, not only the Rhythm Dukes were often missbilled as Moby Grape, but also John Barrett and 'Fuzzy John' Oxendine were, at least once, incorrectly identified as two members of that band! 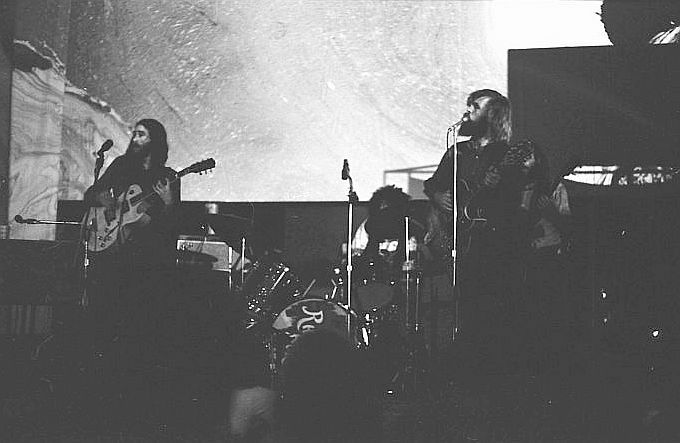 For the second date of their Midwest tour, the band opened for The Steve Miller Band at an unidentified basement blues club/bar. "In Chicago, I remember speaking with Steve Miller," John Barrett recalls. "He was joking about people saying he was Jerry Miller's little brother." 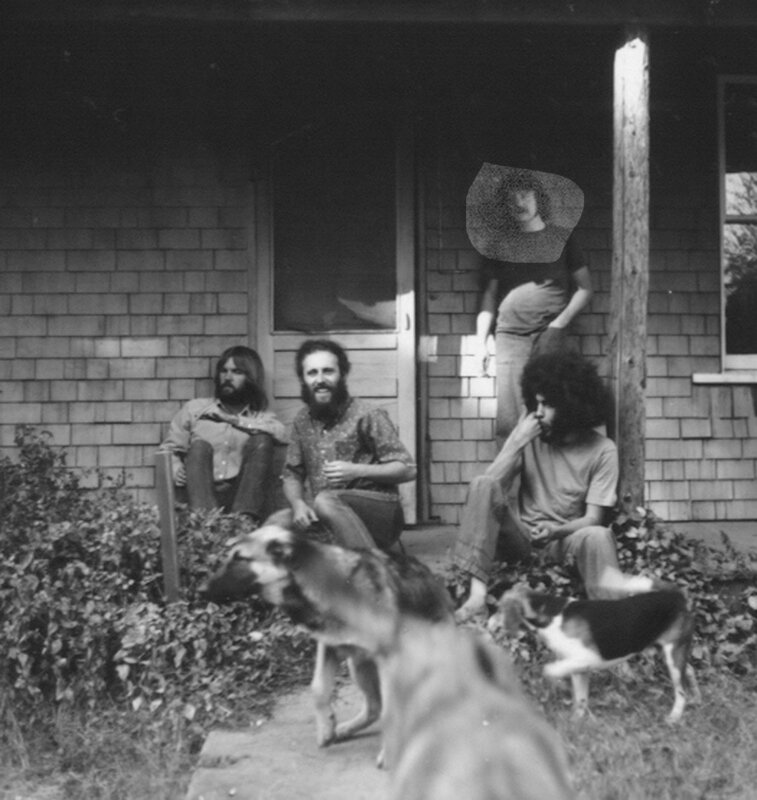 "We stayed at a 'dude ranch' outside of Chicago for several days," Bill Leidenthal also recalls. "The band played a few times in the restaurant/ballroom. Fuzzy and I went horseback riding one afternoon, I got thrown and had to walk back. Hahaha." 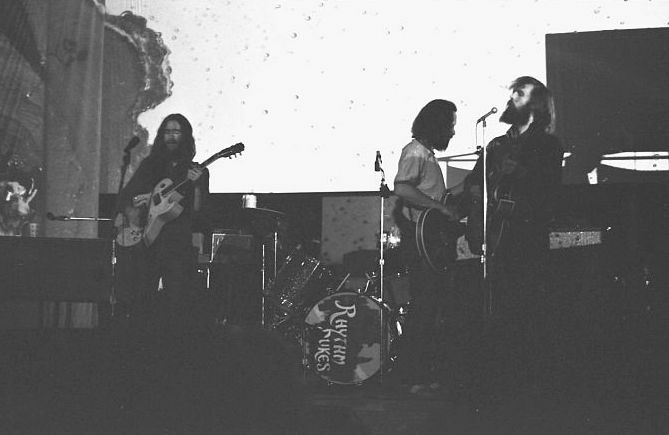 For the third date of their Midwest tour, the band played as headliner at a two-day rock festival held at the Urbana High School. Also on the bill: Uncle Meat, Guild, Cryan Shames, Gold (or Mud; no one remember exactly how the band was called by then), and a lot of other local and national acts. 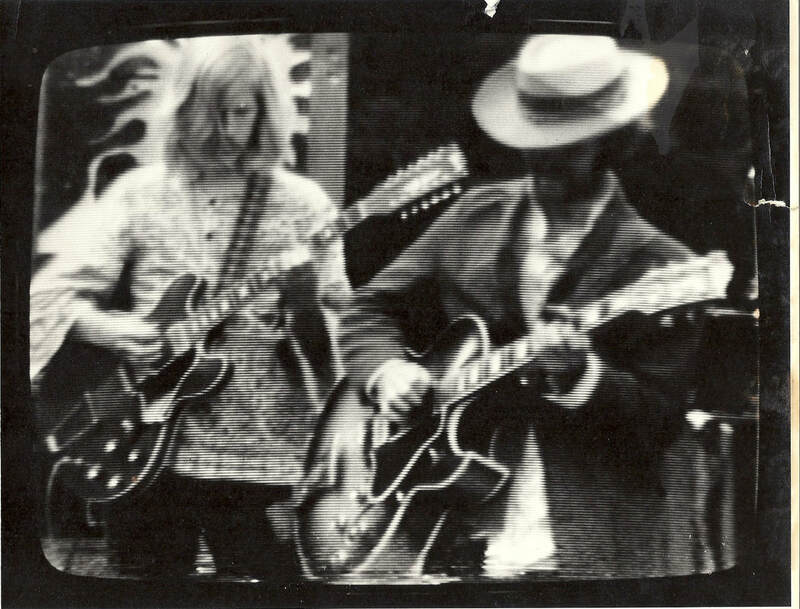 "Moby Grape was the headliner of the show," Erik Krogh of Gold recalls, "but only Jerry Miller was from the original group and it seemed like they just jammed." "I never saw Moby Grape live, but did manage to see the Rhythm Dukes in '70 at a all-day music festival at Urbana High School," eyewitness Jeffery Dunn recalls. "They were great, and Jerry Miller was definitely SMOKIN'." 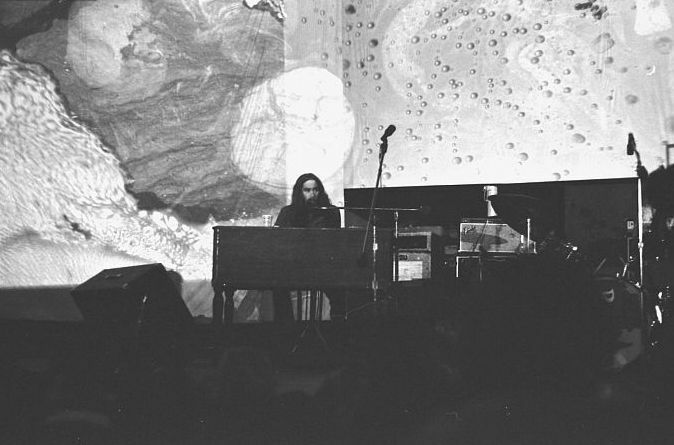 The band moved from Illinois to Missouri by train, for the fourth and last date of their Midwest tour. "We did rip it up big time in St. Louis, an amazing gig. I'll never forget that one," John Barrett recalls. "On the first song, Fuzzy kicked the drums all over the place and we had to stop playing while stage crew came out with hammer and nails and nailed the drums down. The crowd went crazy! They were chanting 'Nail them down, Nail them down'. The gig provided us with the money to fly home to Santa Cruz!!" "After the Armory show," John adds, "we went to a nightclub to party with locals in downtown St Louis. The next day, we got on the train back to Chicago to meet up with Timo [the band manager] and Leidenthal then on the plane home." 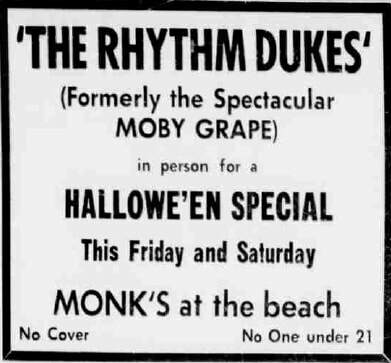 The band was advertised as 'Rhythm Dukes with Terry [sic] Miller (from Moby Grape)'. Also on the bill: Floating Bridge, plus surprise group. Lights by Rainbow Jam. These shows, which started at 8:30pm each day, were promoted by the Family Dog, a production company founded three year earlier by the great late Chet Helms, former manager of Big Brother and The Holding Company. One show, started at 9am. Also on the bill: Silver Chalke, Brothers Day, Snail, Paw, 25th Century Ensemble, Field Machine, and many more. 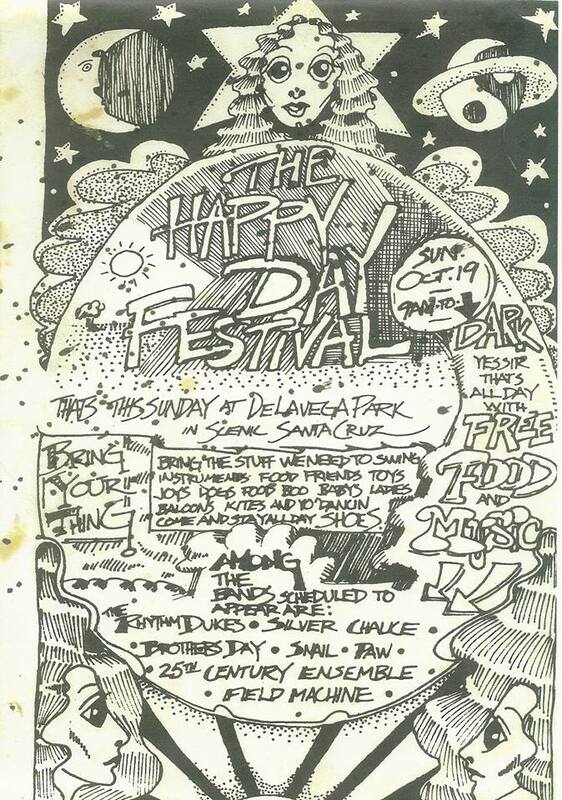 Although billed on the poster printed for this show, The Rhythm Dukes ultimately did not played because the police closed this festival down after about one hour because the electric apple cider was causing casualties. "Yes, the cider," John Barrett recalls. "Emerald [Boogie's former manager and John's best friend] had some pure liquid LSD, and Dennis Cox [a surfer friend of the band] put too much in the cider. He warned the Hells Angels to just do a sip. They laughed and chugged the gallon. Soon it was pandemonium. Choppers falling over, screaming and chaos. The Angels could not even walk, let alone ride a bike. I was outside the park so I did not see that but heard it. The cops came and blocked our entrance. They said: 'go home, the gig is over'. So we did, but really scared because the cops had Dennis down at the station, and we had Emerald's LSD in the fridge, enough for 10,000 hits and a Colt rotary tabless presso in the barn. We were afraid he would squeal on us. Hog Steve [Rhodes, band's roadie] and [his wife] Loretta took off for the city, Britha and I headed south to Castroville or further and got a motel. The next day, went back, Dennis had not squealed and got out somehow." The band was advertised as 'The Rhythm Dukes (Formerly the Spectacular Moby Grape)'. John Barrett and Britha Dahle's daughter Kristina was born at The Farm. Sadly she passed away in 2000 for cancer. 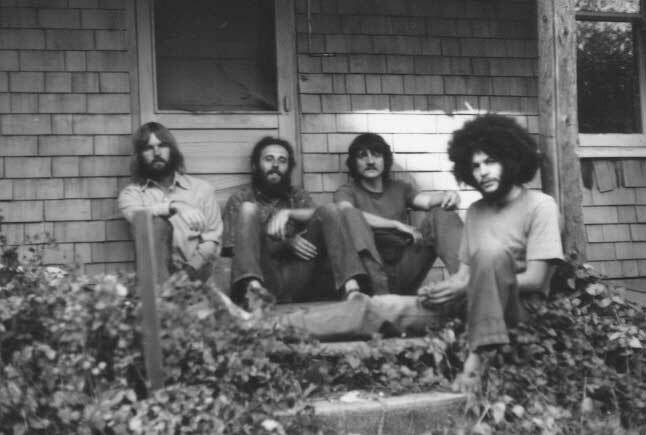 The band was advertised as 'Rhythm Dukes featuring Jerry Miller of Moby Grape'. Also on the bill: Axunder Vault. One show, started at 8:30pm. The Rhythm Dukes yearned for more substance in their music so they added Fuzzy John's old friend Edward Johnston Torney III, aka 'Ned Torney', on electric piano and rhythm guitar, formerly of Chocolate Watchband. 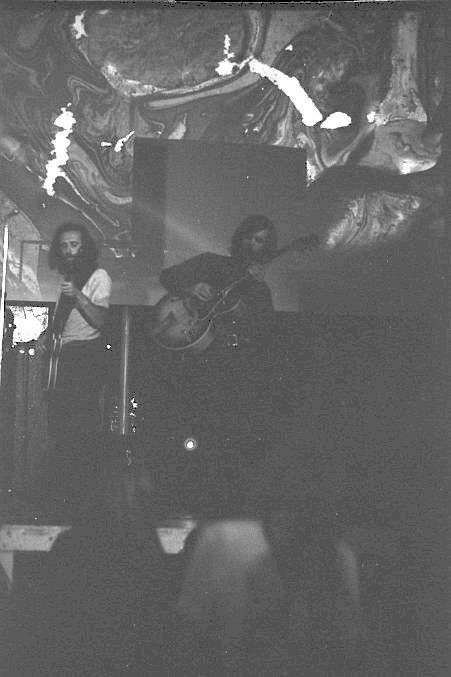 Fuzzy John and Ned had played together in a "unnamed rehearsal band" back in 1965. "Believe it or not, it was Chocolate Watchband before they had that name and that is where I met Ned," Fuzzy John confirms. "He did plays keys which is why I wanted him to play in the Dukes." 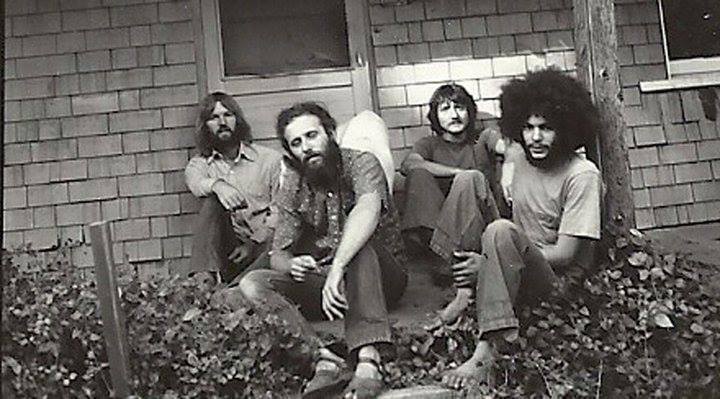 The band also added John Barrett's old friend and former Boogie's bandmate Henry F. Garcia, aka 'Rick Henry' (b. Los Angeles, California), on tenor sax. "When Don left the Dukes, we were a trio for a while and it was hard, Miller carrying it all," John Barrett also confirms. "So that is when Fuzzy asked Ned to play with us, and I called Rick. We [John and Rick] were sax players in the military band together. His real name is Henry F. Garcia (I don't know what the F is for), but we called him Rick because Enrique is Henry in Spanish. Then nick named Rick Henry by Jerry Miller who re-named everybody, even himself!" 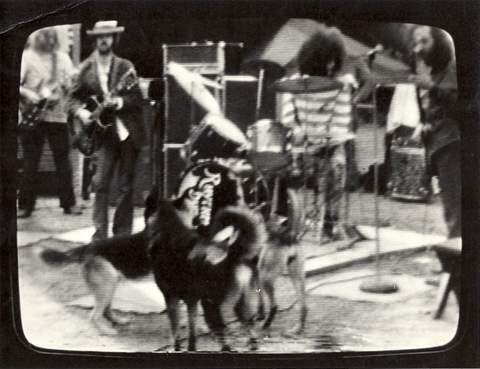 During their Army days in Columbus, Georgia, John and Rick also formed a rock band off duty called The Gimps (John on bass and Rick on sax and tambourine). "Good band," John adds, "then they sent us to Vietnam with the Army division called 1st Air Cavalry." 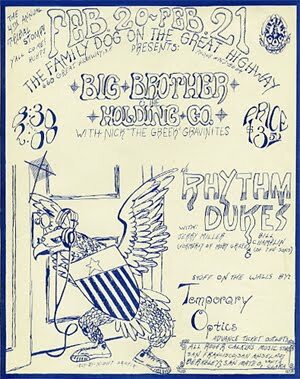 The band was billed as 'Rhythm Dukes with Jerry Miller' on the poster printed for these shows promoted by the Family Dog. 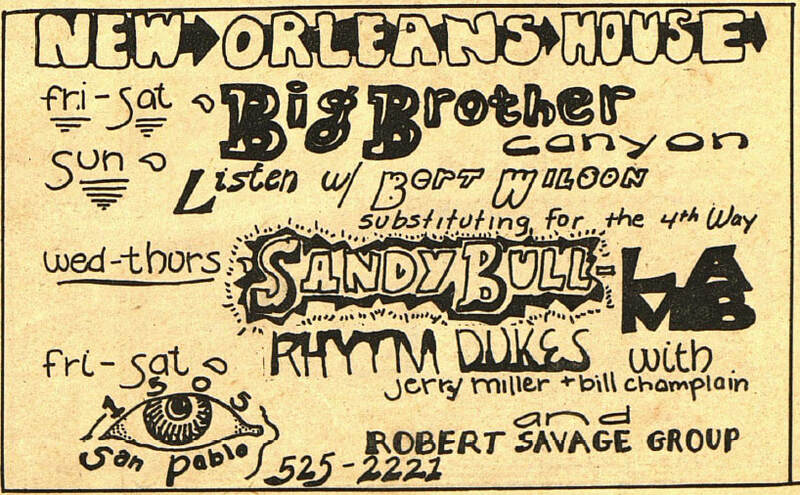 Also on the bill: Canned Heat, Bob McPharlin. 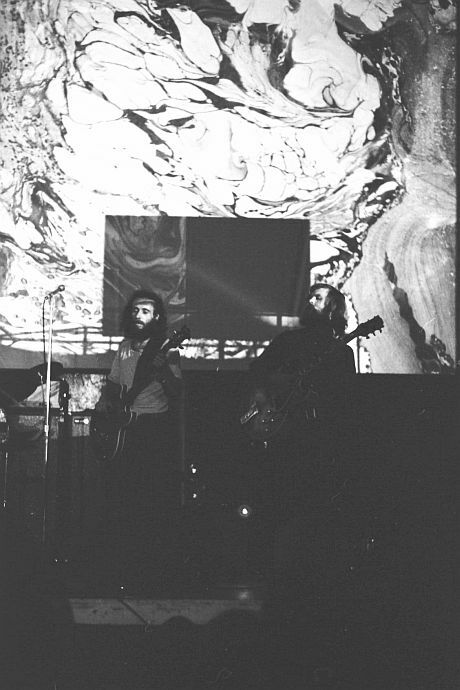 "As I remember, that was a hot gig, and Canned Heat were reluctant to follow the Rhyhm Dukes performance," John Barrett recalls. "They did and were excellent!. 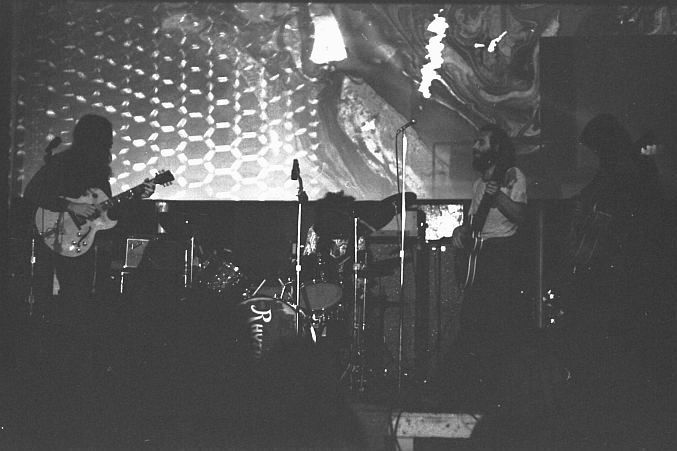 The Canned Heat gig is the only one I really remember, because we played so hot. Tore up! Enough to cut through the haze and retain that one!" 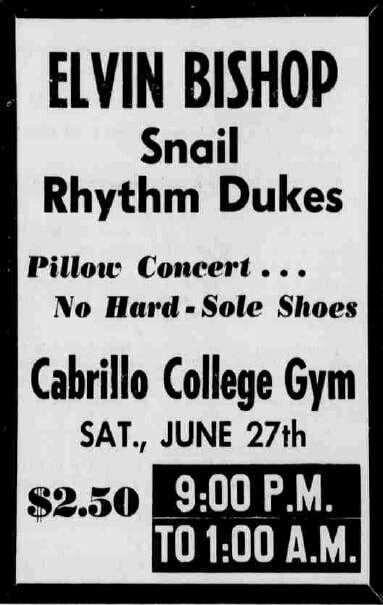 By the way, a very good audience tape recording (the Dukes on one side, and Canned Heat on the other) of one of these shows survived. The seven tracks listing for the Dukes' side was: 'unknown title [start cut]', 'unknown title, 'unknown title', 'I Don't Know If I Was Right [start cut]', 'Forest Black', 'unknown title', and 'instrumental'. 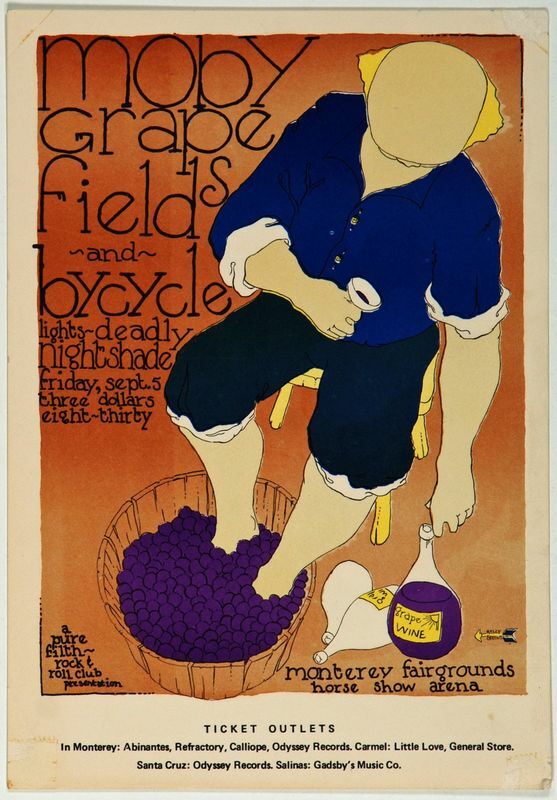 The band was billed as 'Rhythm Dukes (Moby Grape)' on the poster printed for these shows. 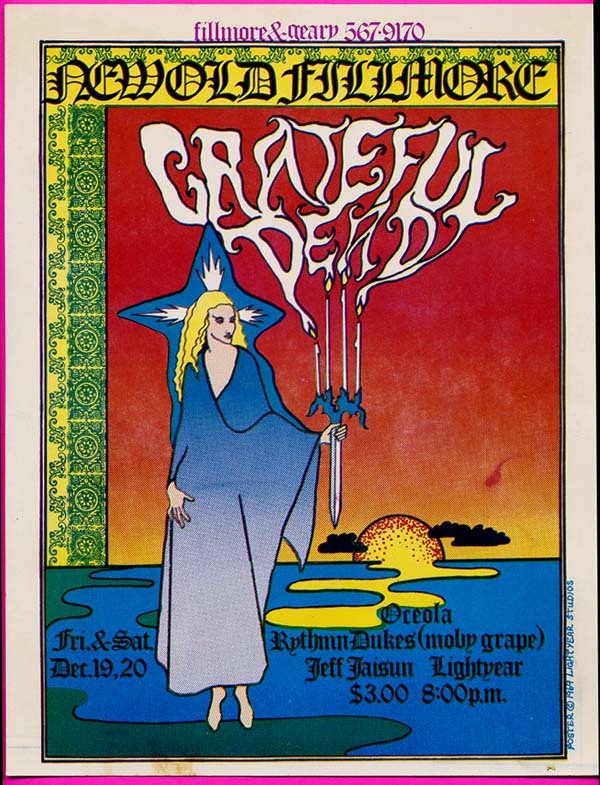 Also on the bill: Grateful Dead, Osceola, Lightyear, Jef Jaisun. One show each day, started at 8pm. "I remember the room upstairs partying with the Dead," John Barrett recalls. Also on the bill: John Hammond. Ned Torney and Rick Henry leave the band. Ned sadly will passed away in November 2005, while Rick disappeared from the scene. "I'd like to find Rick, but he has vanished," John Barrett confirms. The pair were replaced by the Dukes' old friend Bill Champlin (b. William Bradford Champlin, Wednesday, May 21, 1947, Oakland, Alameda County, California) on vocals, rhythm guitar, and organ Hammond B-3, who was on hiatus from The Sons Of Champlin. "Bill moved to Lompico [Santa Cruz County] with his wife Elaine and their two kids to be in the Dukes," John Barrett recalls. 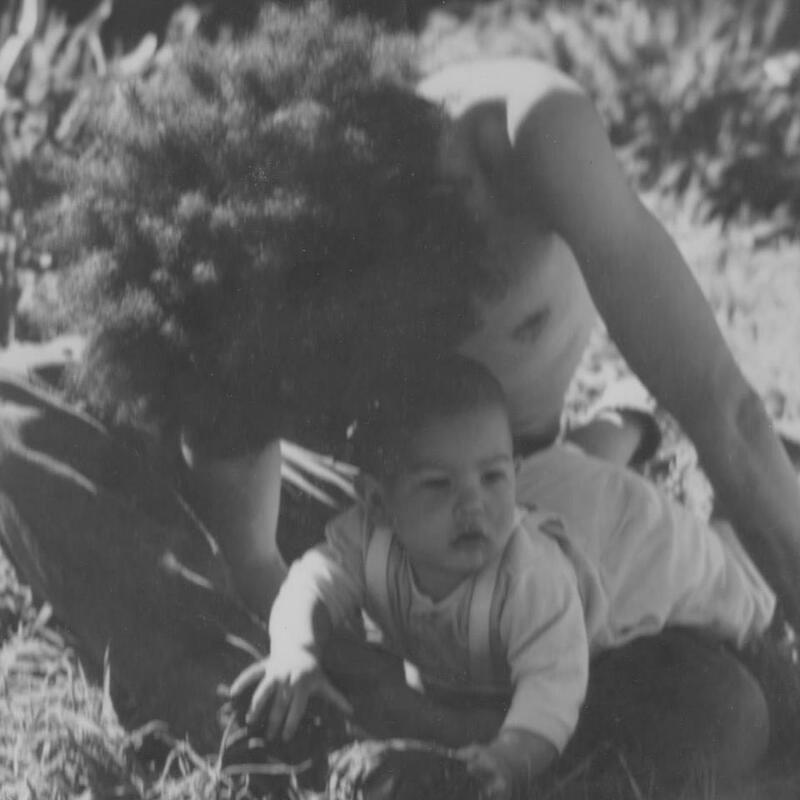 "Bill did join up in Jan '70, had his daughter born at home then. Never forget that!" Along with Bill came faithful roadies Charlie Kelly and "Hog Steve" Rhodes, formerly of the Sons too (Hog Steve and his girlfriend Loretta also went to live at the farm, replacing Fuzzy and his family who then moved into a house in Boulder Creek). "In early 1970, Bill Champlin decided that he was going to move to Santa Cruz, and joined a band called the Rhythm Dukes," Charlie Kelly recalls. 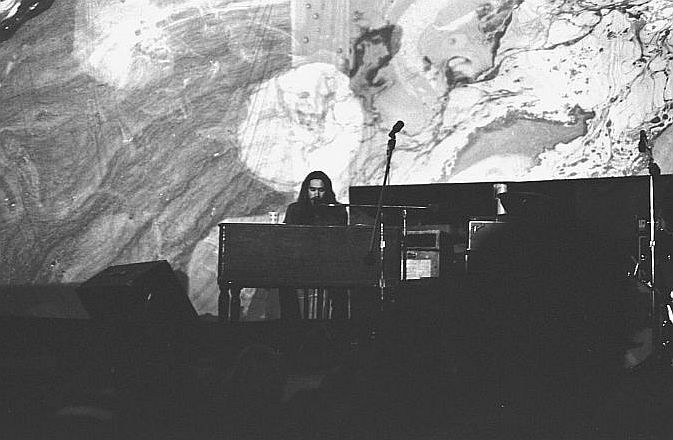 "The first Rhythm Dukes gig with Bill took place before he had even moved down to Santa Cruz, and there was this little problem of getting the Hammond down there, about 100 miles. I knew a girl with a pickup truck, and I asked her if she wanted to go to Santa Cruz for the weekend with me. Oh yeah, do you mind if I throw a Hammond, Leslie and a Twin Reverb in the truck? Oh, did I mention we're driving your truck? We got the stuff down there, and after a day or so, the girl started to get the feeling that I was more interested in her truck than in her. Maybe I said something, I don't know. She took off in a huff and drove home, leaving me in Santa Cruz with all this equipment that had to be brought back to Marin. I had to practically hitchhike back with it. 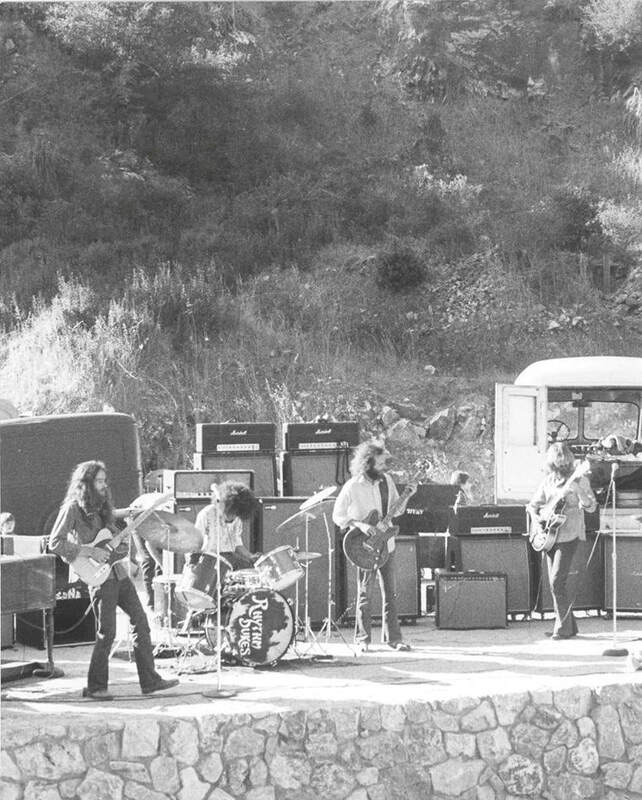 I had my bicycle with me, so combed the area, asking about anyone who might be heading north, and I finally found some hippies who dug the band and had a VW bus headed up the coast. We loaded the gear and got it home." 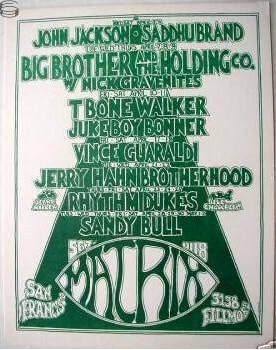 The band was billed as 'Rhythm Dukes with Jerry Miller and Bill Champlin' on the poster printed for this show. The Sons Of Champlin were still actively touring at this juncture, but Bill Champlin already debuted with the Dukes tonight. 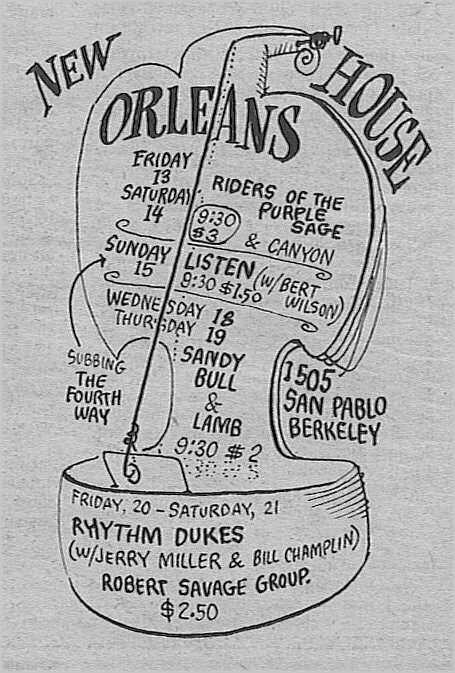 Although they were billed (as 'Rhythm Dukes with Jerry Miller and Bill Champlin formerly of Moby Grape and The Sons') on the poster printed for these shows promoted by the Family Dog, the band finally did not play because Bill Champlin was busy with The Sons Of Champlin's heavily publicized "farewell" shows that same weekend, so at last minute Cat Mother and The All Night Newsboys filled in for the Dukes. Also on the bill: Big Brother and The Holding Company with Nick 'The Greek' Gravenites. Lights by Temporary Optics. One show each day, from 8:30pm to 2am. These shows, which started at 8:30pm each day, were promoted by the Family Dog. 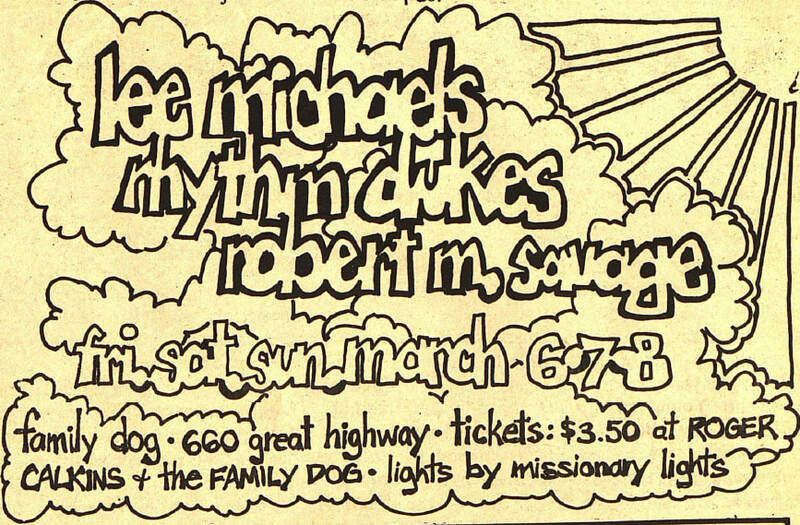 Also on the bill: Lee Michaels, Robert M Savage. Lights by Missionary Lights. Also on the bill: Snail. The show, which started at 8:00pm, was promoted by Whitelady Productions. The band was advertised as 'Rhythm Dukes (with Jerry Miller & Bill Champlin)'. 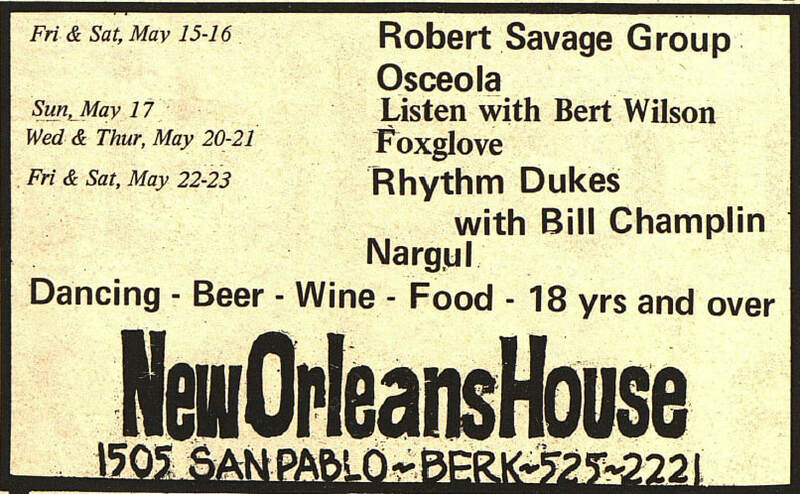 Also on the bill: Robert Savage Group. One show each day, started at 9:30pm. 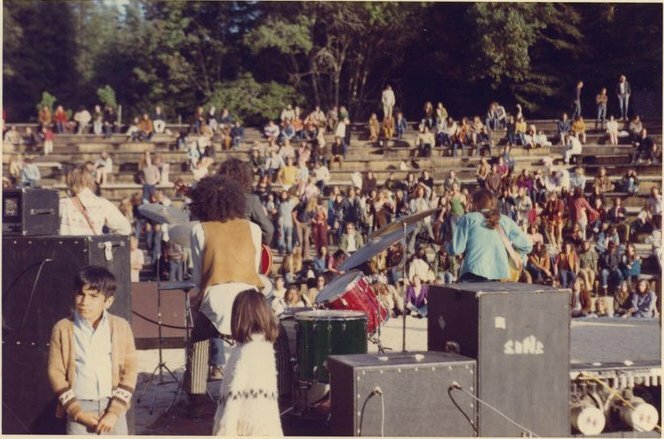 ​The band played there several times that spring. 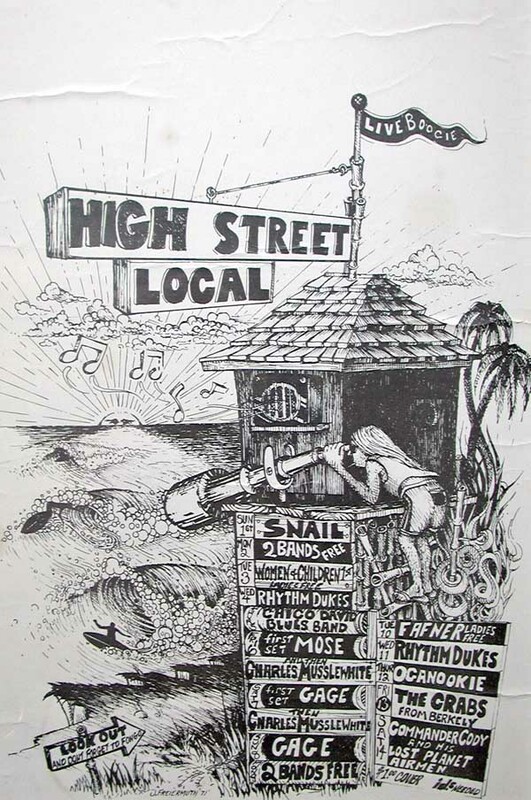 Also on the bill: Snail, Joint Possession. 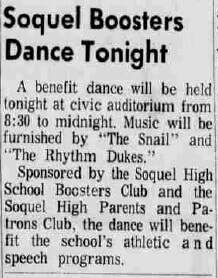 A benefit show held from 8pm to 1am, and sponsored by the Soquel High School Boosters Club and the Soquel High Parents and Patrons Club, to raise fund for the school's athletic and speech programs. These shows were promoted by the Family Dog. 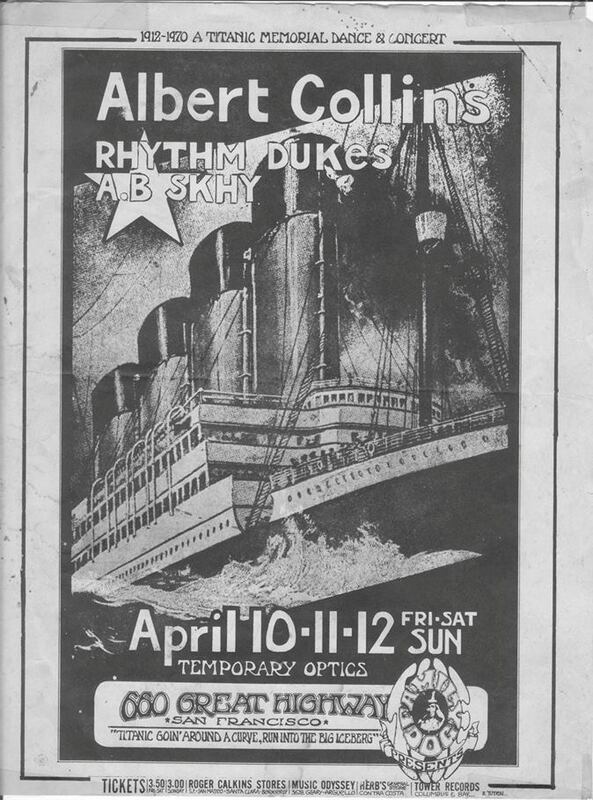 Also on the bill: Albert Collins, A.B Skhy. Lights by Temporary Optics. 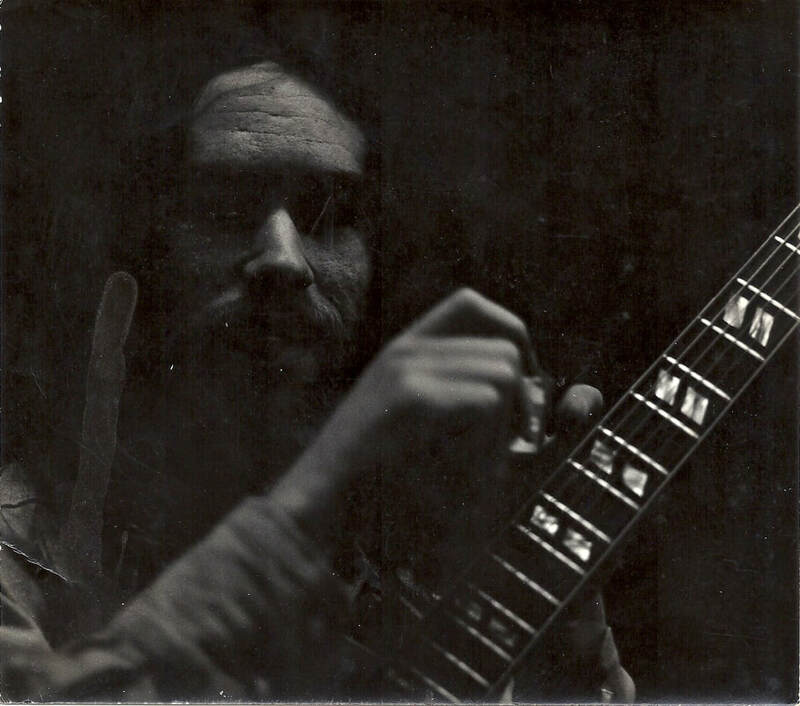 The late music producer and engineer Bruce Walford, an old friend of Bill Champlin since the days he produced the Sons Of Champlin, recorded a demo tape of The Rhythm Dukes at The Church, a recording studio in San Anselmo which was also previously used as a rehearsal space by the Sons. The 10 tracks appear to be recorded live in the studio, with some modest piano and harmony vocals overdubs from Bill Champlin. Bill sings lead on 8 of the 10 tracks (and wrote 6 of the 10 tracks), all but one of which turned up in some form in the Sons repertoire in the next few years (the exception was a cover of Leiber & Stoller's 'Kansas City'). The Rhythm Dukes, however, had a more laid-back bluesy feel than the Sons uptempo, swinging sound. 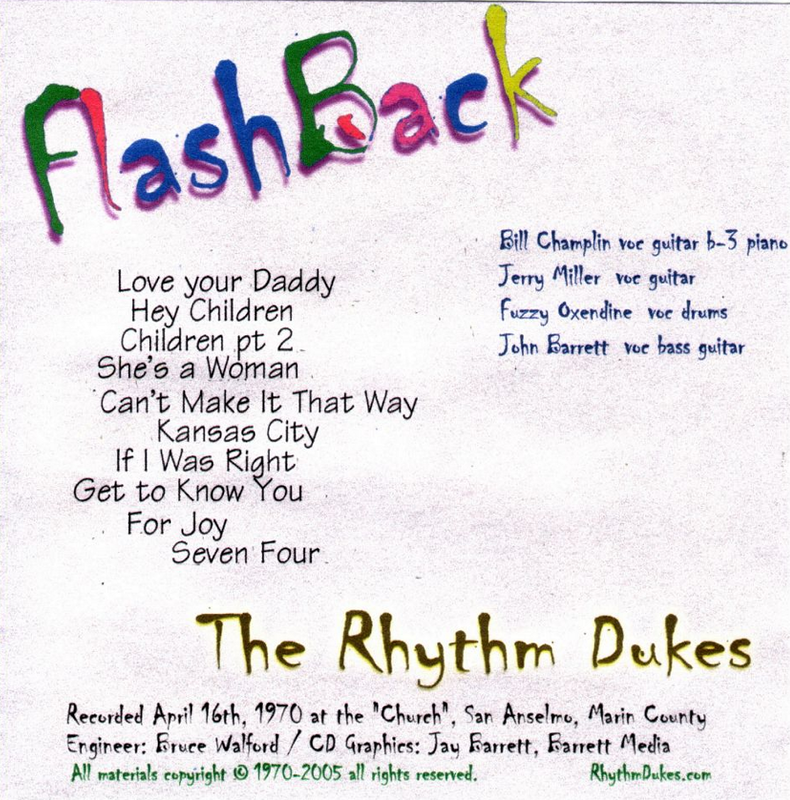 The material was officialy but privately released in 2005 on a CD only available directly from the band's official website and entitled 'Flash Back' (track list: 'Love Your Daddy All Night (Miller) / Hey Children (Champlin) / Children Part. 2 (Champlin) / She's A Woman (Champlin) / Can't Make It That Way (Miller) / Kansas City (Leiber & Stoller) / If I Was Right (Miller) / Get To Know You (Champlin) / For Joy (Champlin) / Seven Four (Champlin)'). "I had a reel to reel of the church tapes," John Barrett recalls. "I think Bill Champlin sent it to me. We made a cassette copy from the R-to-R tape as the oxide was falling off. I sent it to San Diego where a friend fixed it up in his studio and made it sound much better. He made a CD from it. He was impressed with the musicians on it. I sent CD's to the boys. Fuzzy was bown away, and Mike Somavilla found the original tapes and another Mike... Stubblebine re-mastered them into what we have today. The Flashback CD." 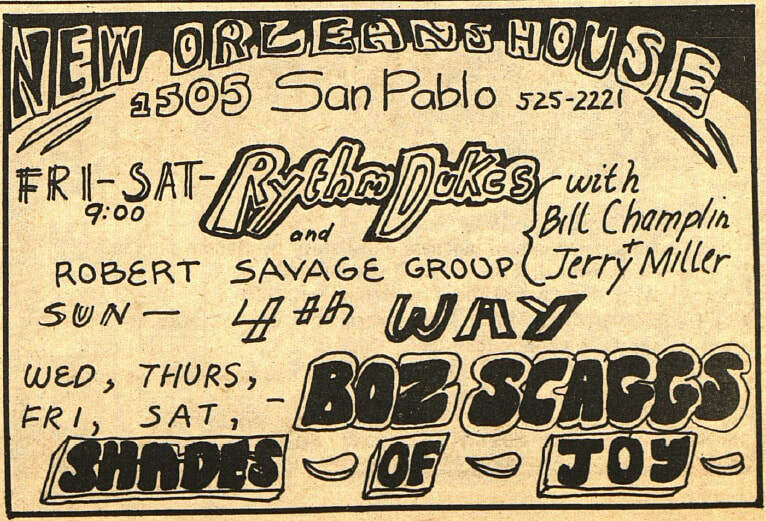 The band was originally billed (as 'Rhythm Dukes with Jerry Miller and Bill Champlin') on the poster and the ad printed for these shows, but they cancelled at last minute for unknown reasons and were replaced by Boz Scaggs (23-24) and Aum (25). One show each day, started at 8:30pm. Sonoma State College Associated Students celebrated 'World Peace Week', also known as 'World Peace Festival', from April 27 to May 1, with music, drama, dance and other arts. According to David A. Freeman, director of the festival: “The festival will give to all those that desire to take part a chance to explore, from a variety of viewpoints, many and diverse problems that must be solved if we are to achieve a peaceful world.” The Rhythm Dukes, along with Helix, Maggie's Farm, and Osceola, played a free afternoon show today, as part of the festival program. Also on the bill: Potter's Wheel. Lights by God's Eye. The show, which lasted from 8:30pm to 2am, was promoted by Whitelady Productions. Also on the bill: Snail. Lights by God's Eye. One show, from 8:30pm to 1am. Some of the proceeds goes to the Stop the War fund. Also on the bill: Maximun Speed, Good Clean Fun. The dance, which started at 8pm, was open to the public and proceeds helped to finance the Student Tutorial Project, which provides remedial instruction and recreational activities for area under-priviliged children. 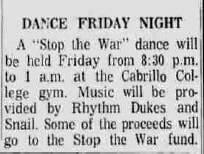 The band was advertised as 'Rhythm Dukes with Bill Champlin'. Also on the bill: Nargul. Also on the bill: Ace Of Cups. Also on the bill: Peter Lewis Group. In the middle of the show Bill Champlin got up from the organ to play guitar, and their seventeen years old friend Dale Ockerman jumped up on stage and sat-in at the organ to play the cover of Tommy Tucker’s ‘High Heel Sneakers’. 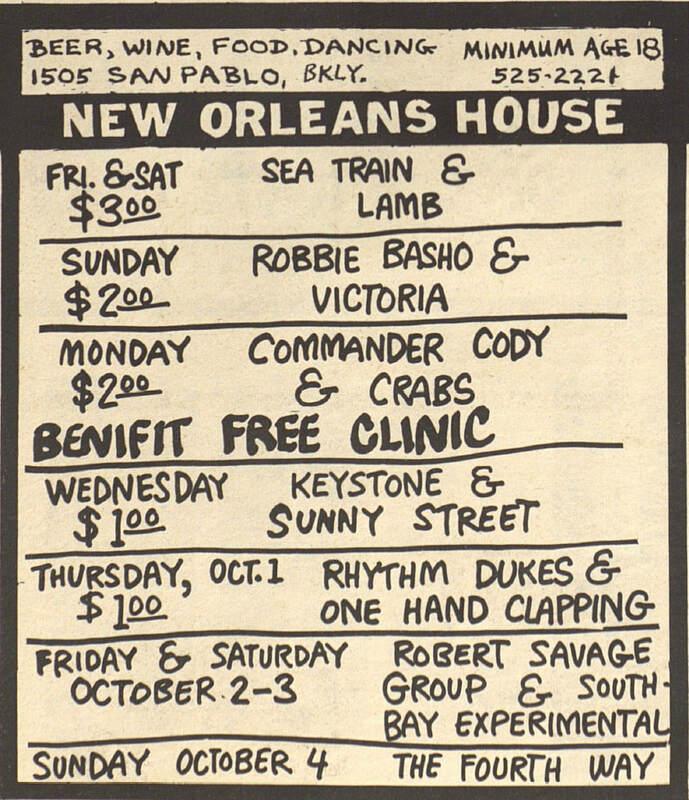 The band was originally advertised (as 'Rhythm Dukes with Bill Champlin and Jerry Miller') on the ad printed for these shows, but they cancelled at last minute because they were already booked to play at another venue that same weekened (see below), so they were replaced by Bronze Hog, and Southbay Experimental Flash (the latter actually filled in for A.B. Skhy, another band that was initially advertised). 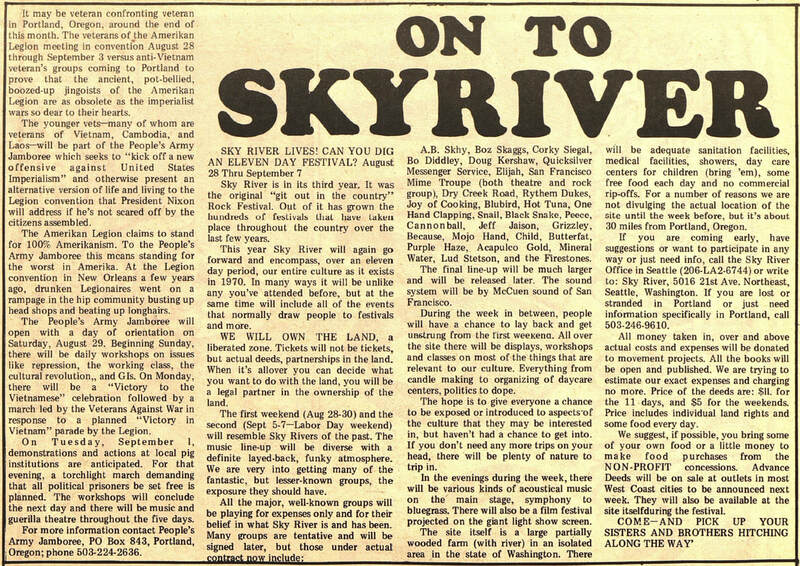 The band was advertised as 'Rhythm Dukes with Jerry Miller and Bill Champlin'. Also on the bill: Vince Guaraldi. 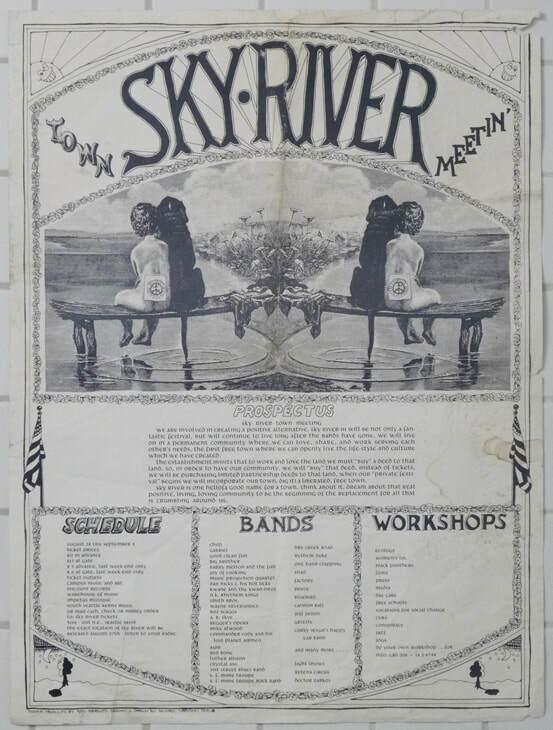 The band was billed as 'Rhythm Dukes with Bill Champlin "The Sons" - Jerry Miller "Moby Grape"' on the poster printed for these shows promoted by the Family Dog. 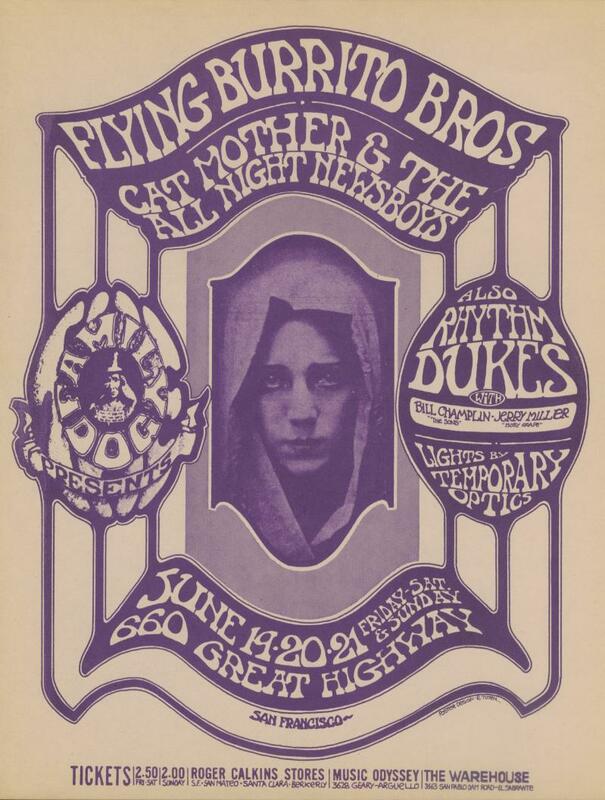 Also on the bill: Flying Burrito Bros., Cat Mother & The All Night Newsboys. Lights by Temporary Optics. One show, from 9pm to 1am. Also on the bill: Elvin Bishop, Snail. 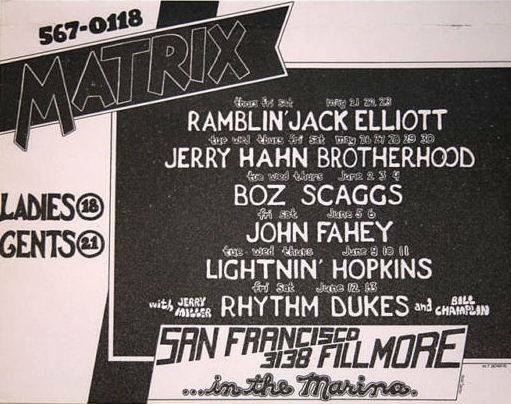 Bill Champlin left the band and Santa Cruz right after this gig, and moved back to Marin County where he briefly joined Nu Boogaloo Express, and then reformed The Sons Of Champlin. 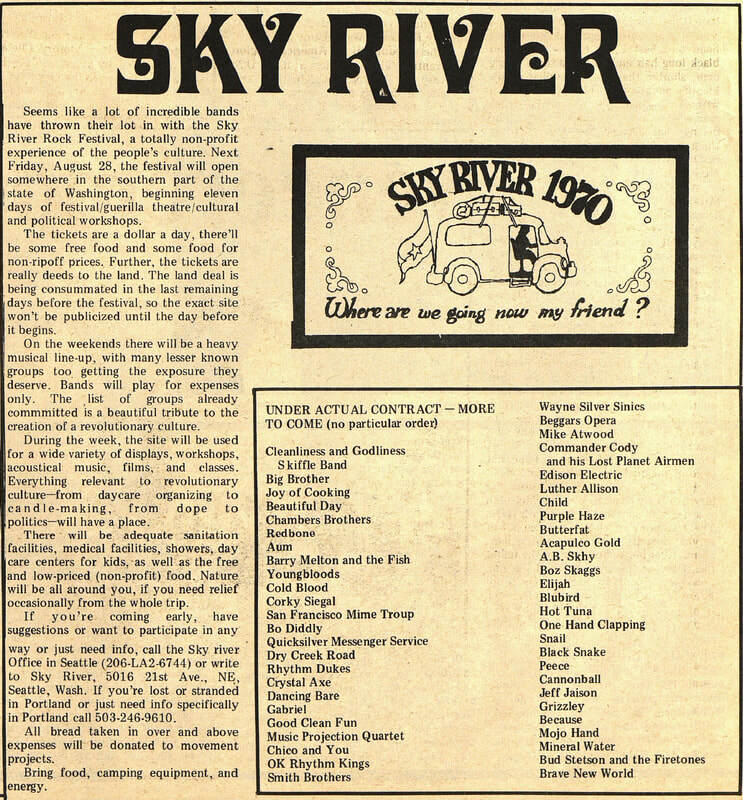 The 3rd edition of the annual Sky River Rock Festival was held from Friday, August 28 to Sunday, September 6. The festival started with three days of music (August 28-30), then four days of workshops that included sessions on news and media and how to curb drug use (August 31-September 3), and finally three more days of music (September 4-6). 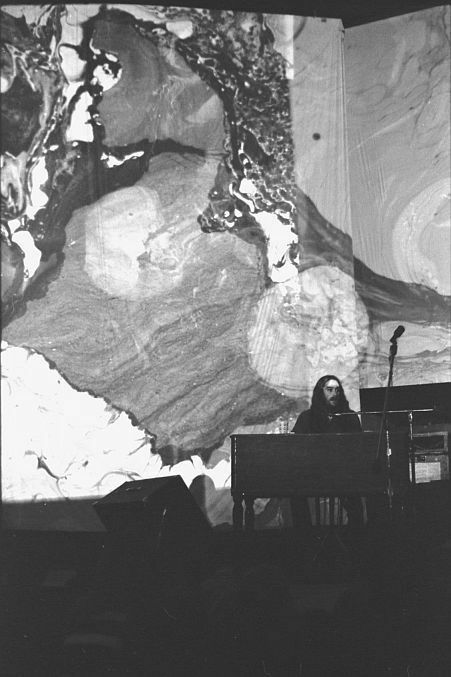 The festival was filmed and was also broadcasted live from 9:30am to 9:00pm on KVAN-AM (1480kHz), a progressive rock radio station located in Vancouver, Washington. The bands played for free, and all the organizers did was pay traveling expenses for them (or, at least, this was what they promised, because finally most of the bands had paid their own way up). The Rhythm Dukes, or 'Rythem Duke' as they were misspelled on the festival programme, played during the second and last weekend of music (September 4-6), although I do not know on which day. 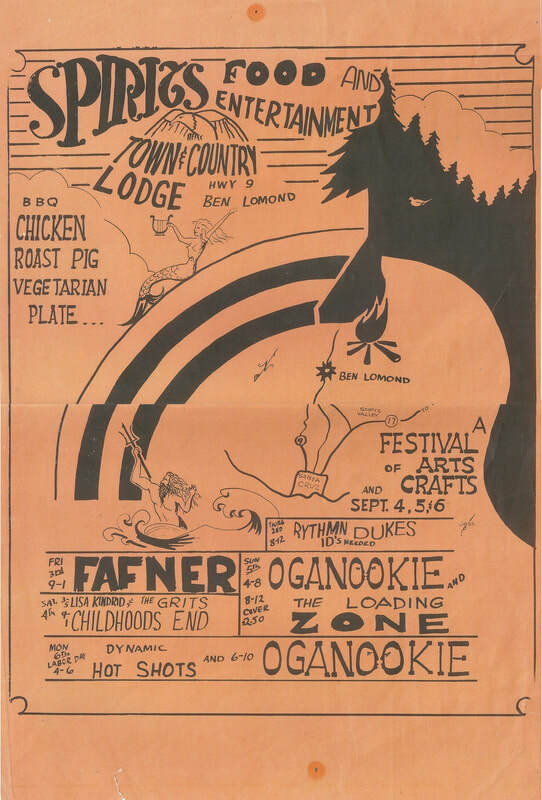 Also on the bill: The Smith Brothers (30), The Wayne Silversonics Band (30 and 4 or 5 or 6), Mojo Hand (30), Jefferson Airplane (4 or 5 or 6; canceled), Big Brother and The Holding Company (4 or 5 or 6; canceled), Crosby Stills Nash & Young (4 or 5 or 6; canceled), The Yongbloods (4 or 5 or 6), The Factory (4 or 5 or 6), Good Clean Fun (4 or 5 or 6), Fox (4 or 5 or 6), High Voltage (4 or 5 or 6), A.B. 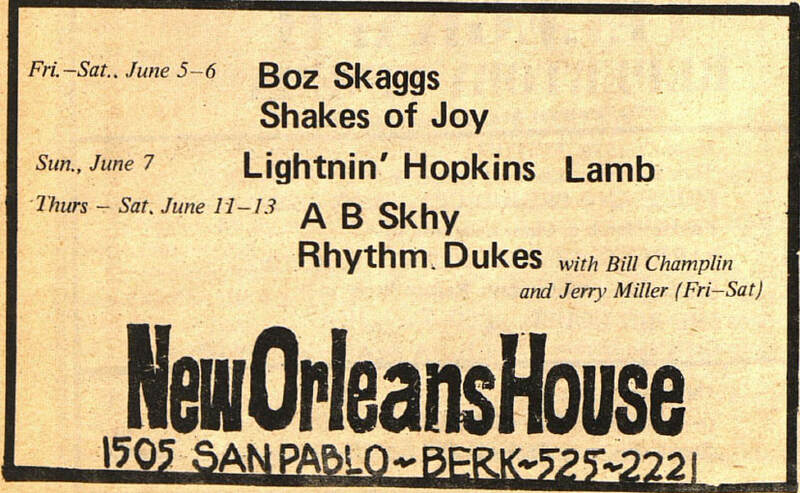 Skhy, Boz Scaggs, Corky Siegel's Happy Year Band, Bo Diddley, Doug Kershaw, Quicksilver Messenger Service (canceled? ), Elijah, San Francisco Mime Troupe (30), Dry Creek Road, Joy of Cooking, Bluebird, Hot Tuna (4 or 5 or 6; canceled), One Hand Clapping, Snail, Black Snake, Peece, Cannon Ball, Jeff Jaisun, Grizzly, Because, Child, Butterfat, Purple Haze, Acapulco Gold, Mineral Water, Bud Stetson and The Firestones, Cleanliness and Godliness Skiffle Band (canceled), It's A Beautiful Day (canceled? ), Chambers Brothers, Redbone, Aum, Barry Melton and The Fish, Cold Blood, Crystal Axe, Dancing Bare, Gabriel, Music Projection Quartet, Chico and You, O.K. Rhythm Kings, Beggars Opera, Mike Atwood, Commander Cody and his Lost Planet Airmen, Edison Electric, Luther Allison, Brave New World, Whiz Kids, Sweet Rool, Space, Cherry Jack, Justice, Xanadu Theater, Island, Company Band, Boulder Creek, 31st Street Blues Band, Passion, Sand, Dan Hicks and his Hot Licks, Kwane and the Kwan-Ditos. Lights by Retina Circus, and Doctor Zarkov. The Rhythm Dukes added John Barrett's old friend and bandmate Russell Dahneke, aka 'Russell Leon', on vocals and rhythm guitar. 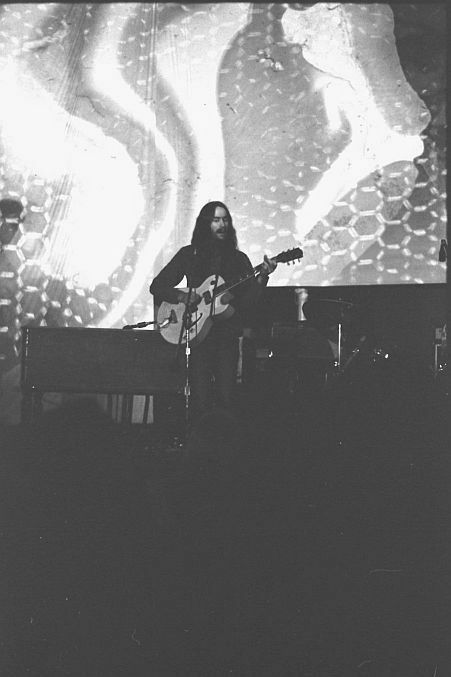 Russell, who lived in Santa Cruz at the time, had player together with John in a band called Pat LaRocca and The Modern Forum back in the mid-60s. Also on the bill: Good Clean Fun, Fred Peterson Quartet. One show, from 8pm to 12 midnight. Also on the bill: One Hand Clapping. Also on the bill: The Doobie Brothers. "We played Chateau a few times," John Barrett recalls. "It was a real dive. Very rough place. Gangs, prostitutes, dope pushers. It was the edge of society way up in the mountains on a dirt road next to a ghost town. Looked like the old west. All boarded up. It was called Holy City." 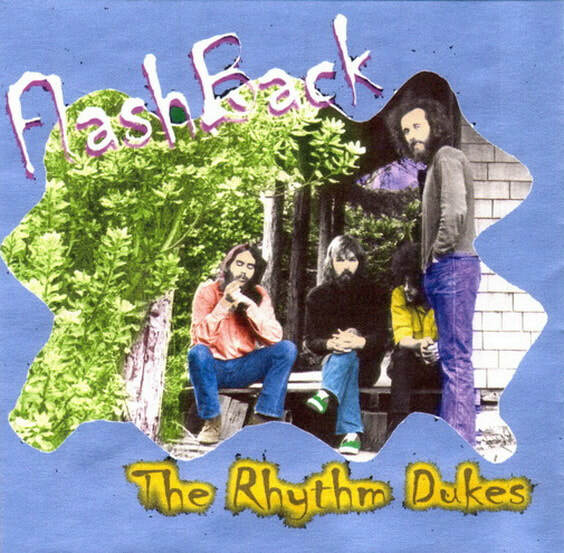 The Rhythm Dukes' performance was recorded by Columbia Records, although they never did anything with the recording, and they just put it into the vault. "That was some great stuff there! !," John adds. "I know they are archived somewhere, they never throw anything away. Getting those tapes would be a home run for us and the record. Columbia recorded on a 32 track Ampex by Columbia Records engineers in a truck parked outside. It was to be a Moby Grpe spin off group record. I used to have a copy but long lost now. That had Russell Leon playing some of his originals." 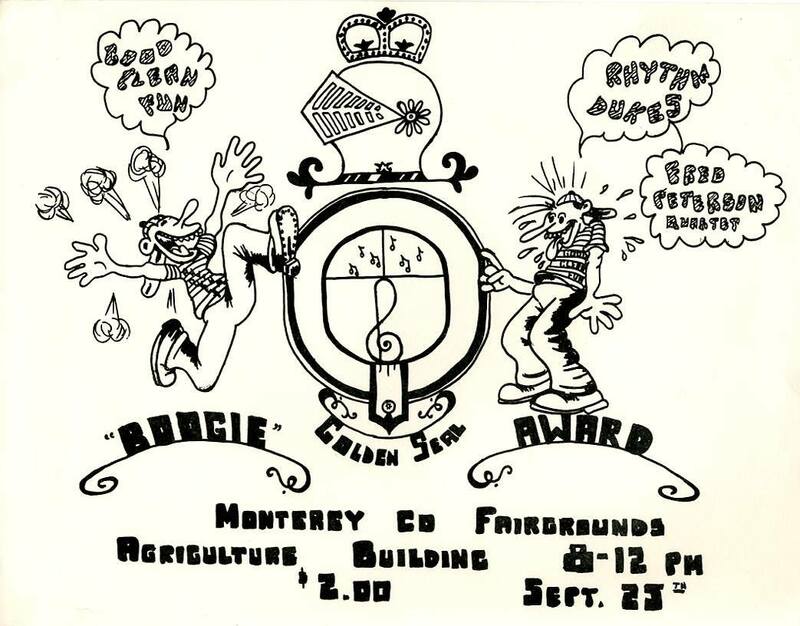 A friend of 'Fuzzy John' Oxendine had a video recording company called Video Rangers in Berkeley, California, and he video-taped some of The Rhythm Dukes shows at the time, including this one. 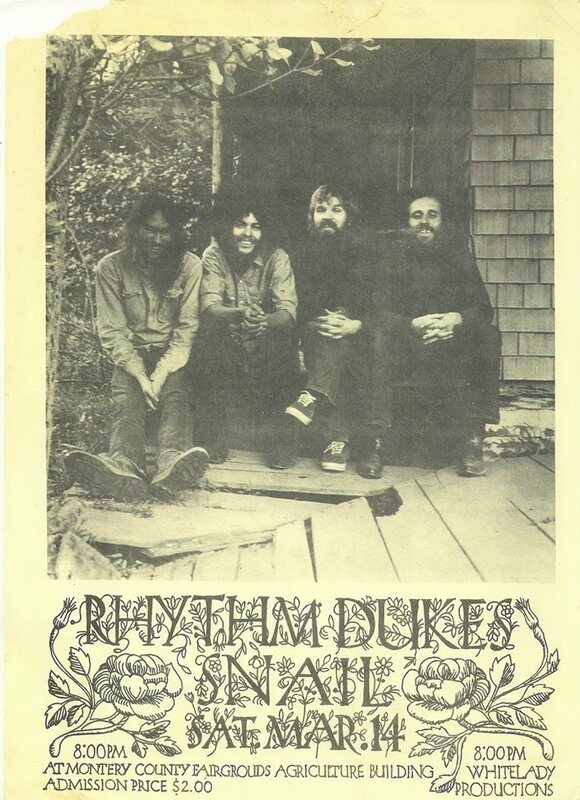 The Rhythm Dukes were on hiatus for a couple of months because, due to contract obligations with Columbia Records, Jerry Miller was trying to make a comeback with Moby Grape at the time (they recorded a new album entitled '20 Granite Creek' which was released in September of that year). "Columbia snagged Jerry for some contract commitments, and we were no-show for some important gigs," John Barrett confirms. "That is a bad reputation to acquire, and we could not reliably predict if we could play or not because of Columbia. Then Columbia started the Granite Creek project, making the Moby Grape guys captive in that house until they produced something." 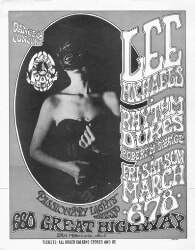 The Rhythm Dukes' performance was recorded. Russell Leon left The Rhythm Dukes. 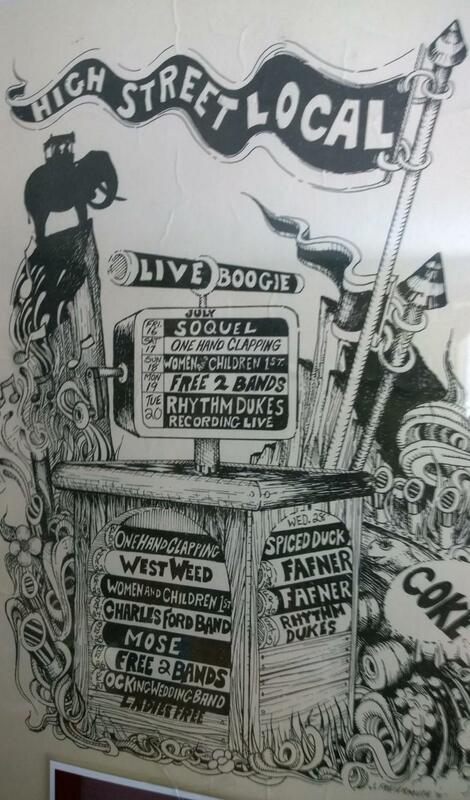 The band was mis-pelled as 'Rythmn Dukes' on the poster printed for this show, which lasted from 8pm to 12 midnight. 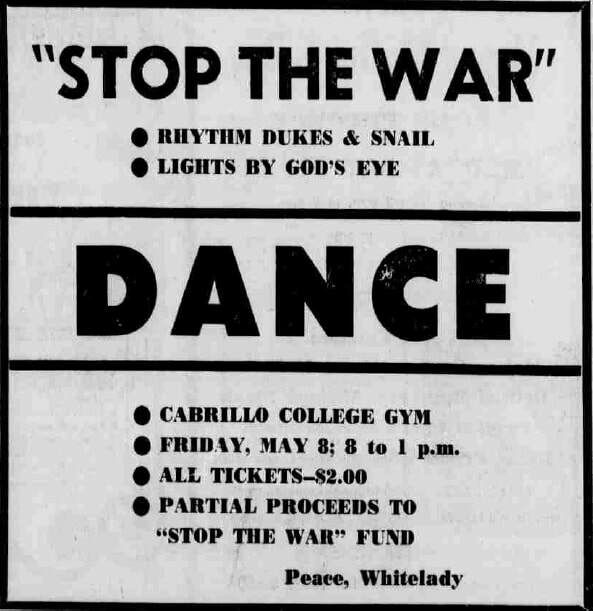 "A group of new friends from my dorm and I were exploring the campus late that evening when we happened onto a dance concert at the spacious Cowell College Dining Hall, down the hill from my own new home at Crown College," eyewitness Michael Parrish recalls. "Holding forth was a power trio that was billed as the Rhythm Dukes, featuring Moby Grape lead guitarist Jerry Miller along with bassist John Barrett and, I presume, drummer John 'Fuzzy' Oxendine. 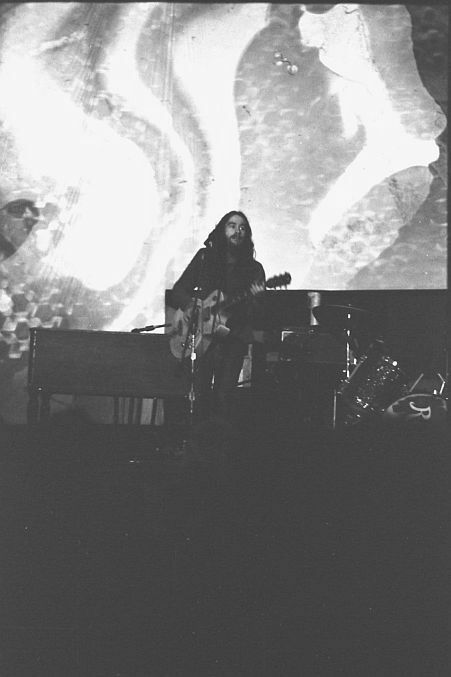 The Dukes show at UCSC was my first exposure to Miller playing live, and his blend of speed and precision was, and remains, a marvel to behold. Details of the set are fuzzy, since I knew none of their material except for Miller’s 'I’m The Kind Of Man That Baby You Can Trust,' which was one of the highlights of [Moby Grape's album] 20 Granite Creek, but there were blues standards, country-inflected workouts, and lots of extended jams. Not bad at all for a free, unadvertised orientation week concert." The Rhythm Dukes disbanded. 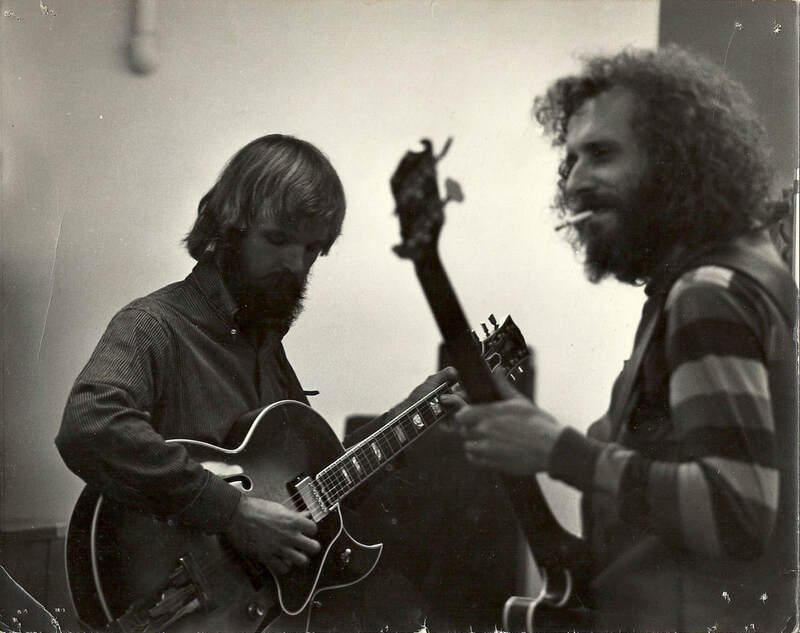 Jerry Miller and Fuzzy John Oxendine remain a steadfast presence in many different bands in the Bay Area for the next several years, and they played together again first in the Mike Finnegan & Jerry Miller Group (1973) and then in one of the many late incarnations of Moby Grape (1978). John Barrett, instead, went back to college for a couple of years and at the same time he also worked as roadie for the Sons Of Champlin, and then moved to Massachussets where he resumed his music career playing with a lot of groups such as Swing Shift, Larry and The Rockets, The Generators, Blue Stars, Mojo Coffee, Sammy Brown Band, Max 2000, Hoodoo Rhythm Dogs, Earth Angels, Dance-Romance, Lil' Donnie and The Rockets, Whitehouse Staff, Berkshire Ramblers, and The Spurs USA. One show, started at 9:30pm. The Rhythm Dukes hold a reunion of sorts at the Crow's Nest tonight. The lineup was the most famous one with Jerry Miller, John Barrett, 'Fuzzy John' Oxendine, and Bill Champlin, plus a couple of guests like their old fan and friend Dale Ockerman on keyboards and veteran sax player Cornelius Bumpus. An audience tape recording of this show survived (track list: 'Unknown / Every Day I Have The Blues / Unknown / Low Down Dirty Dog / Unknown / Unknown / Further On Up The Road / I've Got My Mojo Working / Grease Piece / Going To Be A Change / Can't Be So Bad / Kansas City / Linda Lou / A Little Bit Of Your Love / Unknwn / Unknown / Unknown / Unknown / Naked If I Want To / Band Introductions'). The show was also filmed and a small video extract of their performance was posted by John Barrett on his YouTube channel.